Not much luck today, we need more big storms! 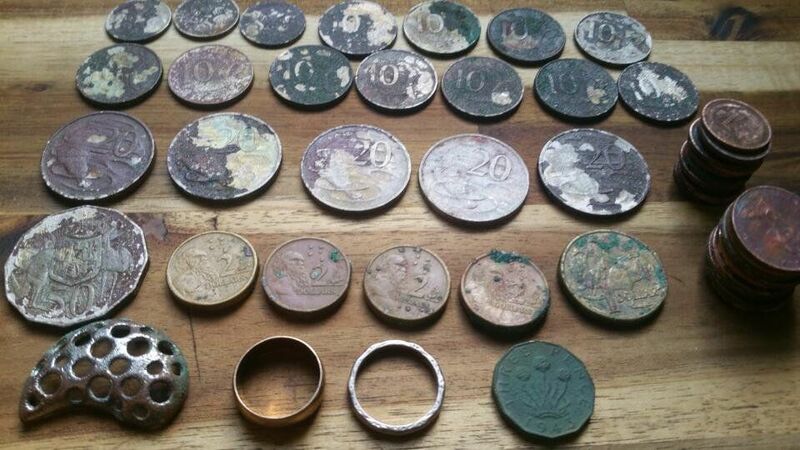 Dug all the jumpy signals today and while most were trash the coins were all hiding next to trash. The bleepin power lines right on the beach don't help either. Managed to find a little spot in an old Goldfield that hasn't been swept clean. Though I was onto a monster nugget patch at first Think the round thing is the lid off a little jewellery box or locket. It had flowers painted on it a long time ago. Don't Expect People to welcome you when your light Shines Brighter Than Theirs - My Happiness reminds people Of Their Misery. Unfortunately not. Brass I think. 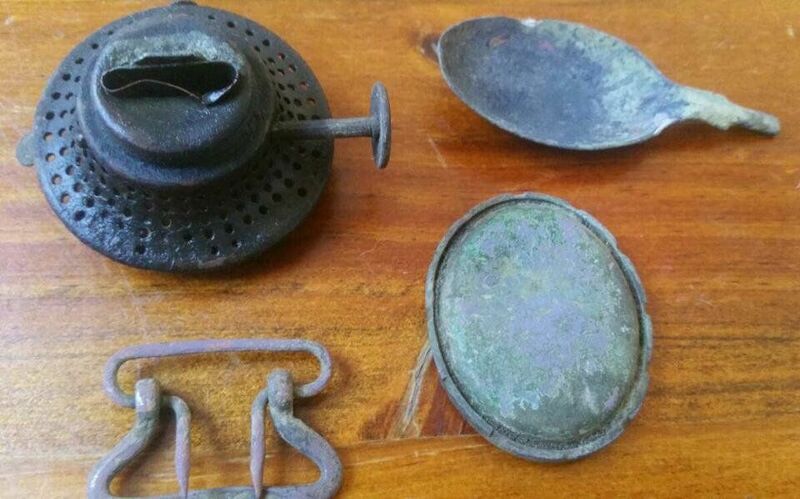 Very nice finds mate.... I like that old lid? Might have been a centre piece for a large pendant. I love finding the older Vic era jewellery, despite not being worth much they still provide a good window into the past on what was typically worn at the time. The beauty of the Nox is it will ping those coins regardless of the emi. I run it over ground now that i couldn't detect because of underground power. you just need to find the quietest setting and either ignore the noise or run in discrim which cuts out the bulk. By descrim do you mean silence all the tones except the ID's you are chasing? I have generally been switching to 5 or 10 kHz single freq when the noise drives me crazy but that seems to make smaller targets disappear. Yeah Dave, if you do it that way it will generally only chatter when you put the tector down to dig a target or when you rest the coil on the ground. You can also drop the Sens if needed. Or alternatively clarify (view) the numbers the emi is affecting and shut those numbers down. Doing it the single frequency way works fine but then you have to cover the ground in each freq. Woo hoo, made it to a fresh cut beach first and got my first little bit of gold! 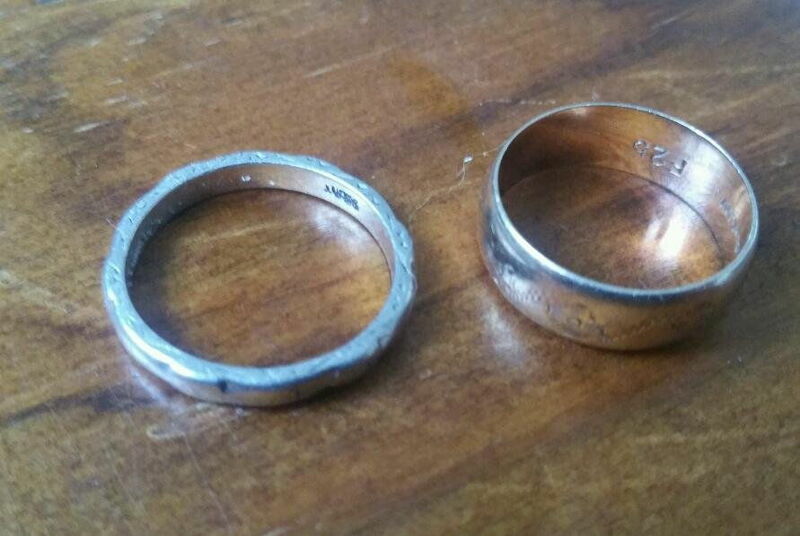 Only 9ct but also a 925 ring and I reckon that was my first 10 dollar day on the spendies too. The only old coin is an English 3p. Never come across one like that before. Sounded and ID'd almost identical to a 10c piece. I know. Will need at least 9 more carrots to make carrot soup! Certainly had a big night digging to earn them. Half of them were by torchlight in single digit temp. love the way the 3p is throwing the party balloons right next to the rings. good hunting D79, the digging would have kept the chill at bay. Nice work, any gold is good gold. I got a 7g 18k white gold ring a while back that I thought was 10c as well, nearly walked away from it too but there was a little nagging sound in my head saying dig it. Glad I did. 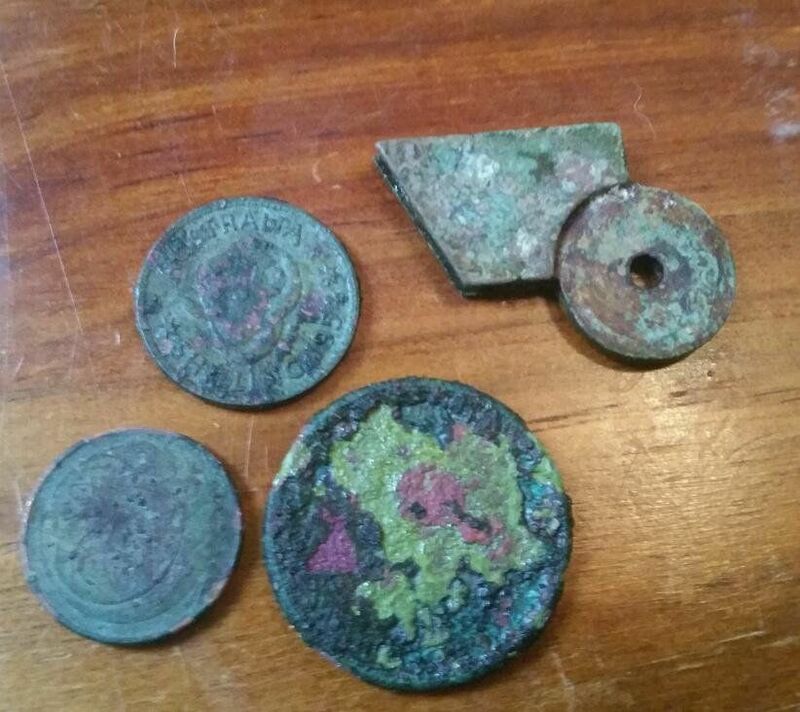 Gave up on the nuggets after 4 hours of iron and lead shot this weekend and got the nox out to go back over a spot where I've found a few relics before. 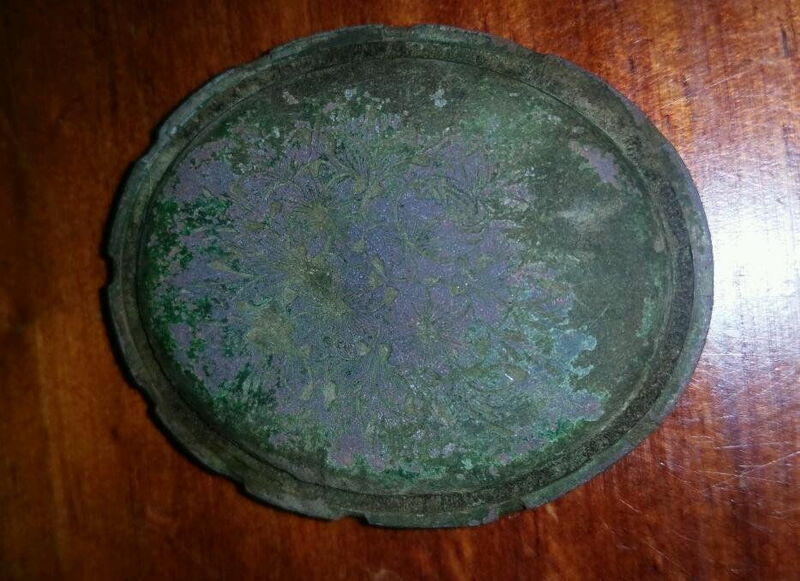 I reckon the embossed bits were a blackpowder flask but it's pretty delicate and hard to clean. 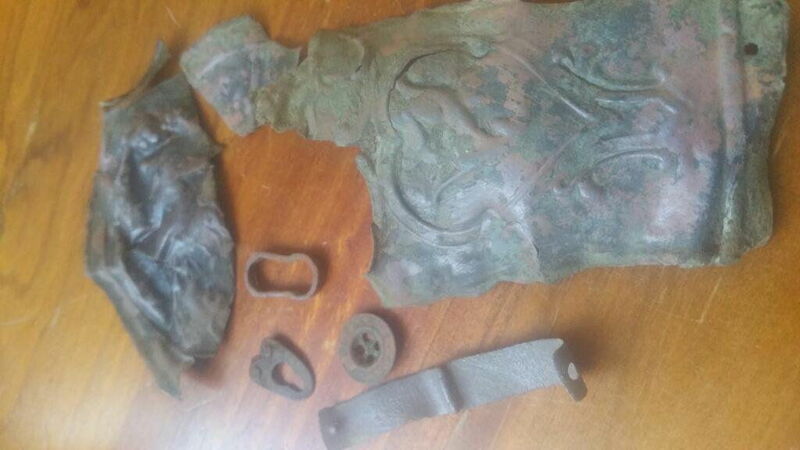 Nice find Dave, they are pretty delicate items to clean, the one I found was folded in half and would have been easily mistaken for a bit of scrap copper.